Consistency has never been Arianna Huffington's strong suit. Consider, for example, her mid-life conversion from passionate conservative to passionate liberal, or the awkward way her eco-evangelizing sits with her habit of bopping around the country in private jets and chauffered SUVs. So when you hear Huffington lauding the firmness and immutability of one of her own positions, as she does in this week's Newsweek, it's good to be skeptical. 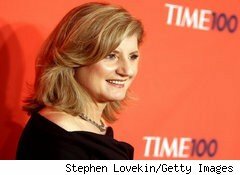 "We have a clear attitude," Huffington tells writer Daniel Lyons by way of explaining the Huffington Post's success. "On the Afghan war, for example, we've been clear that we believe it's an unnecessary war." That certainly sounds better than "We get lots of traffic by writing SEO-baiting headlines about Blake Lively's cleavage," but it's not exactly true. Or, rather, Huffington has been clear that she considers the war in Afghanistan misguided and unnecessary -- but it wasn't so as recently as 2006, when she was equally clear that she believed the opposite. Before she was calling for Joe Biden to take a principled stand against escalation of troop levels, Huffington was hammering on George Bush for cutting troop levels. She described as "devastating" Bush's lack of attention to "the first front in the global war on terror." "What about his commitment to staying the course?" she wondered. The title of Huffington's post: "Will a Stable Afghanistan Be Yet Another Casualty of the War in Iraq?" Pretty clear, right? In other words, Huffington was for the war before she was against it.